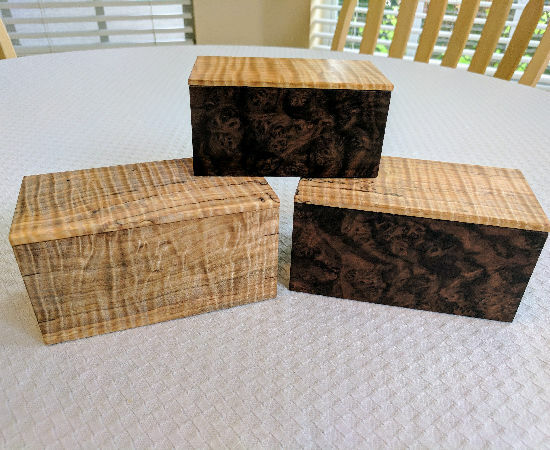 In May of 2015 after a year of watching woodworking videos on YouTube and falling in love with the idea of working wood with hand tools only (the way grandpa used to do it), I decided to jump in with both feet. 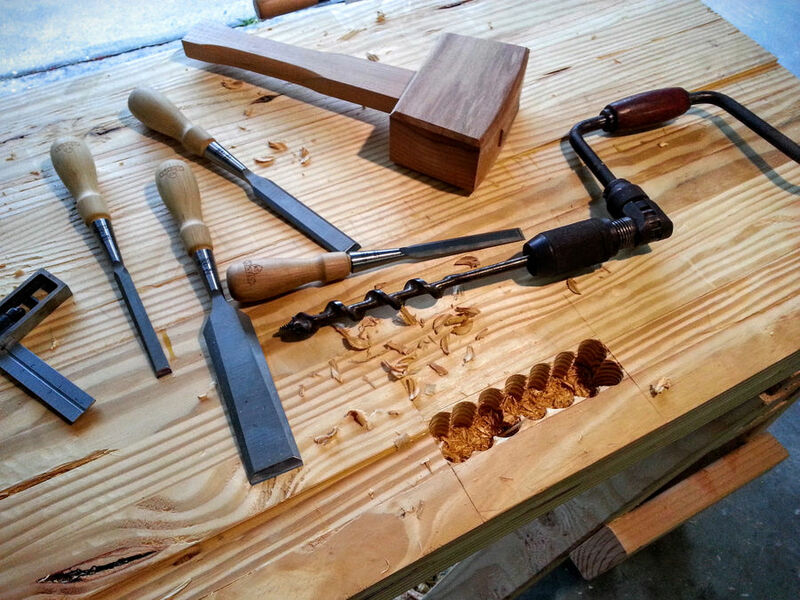 By this time I had assembled a minimalist set of hand tools and I got to work. 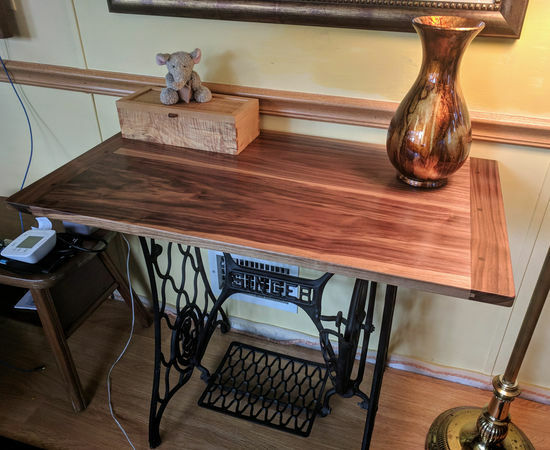 I had been looking at different bench designs and read Christopher Schwarz's book Workbenches, I settled on a design that worked for me as far as material availablity and my own skill level, which I admit was close to zero. OK, as far as the specs for this bench. 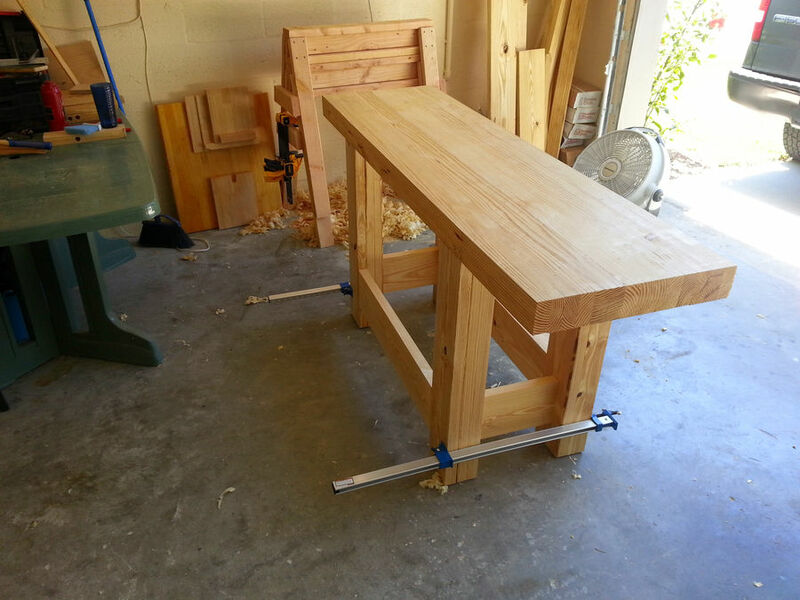 The wood that i used was construction grade Southern Yellow Pine. I used three 12 foot long 2" x 12" for the top. I cut them down to 6 foot and then ripped them into thirds, I planed them flat and then turned them on edge and glued them together. Longer and wider 2"x material has many fewer knots to deal with. 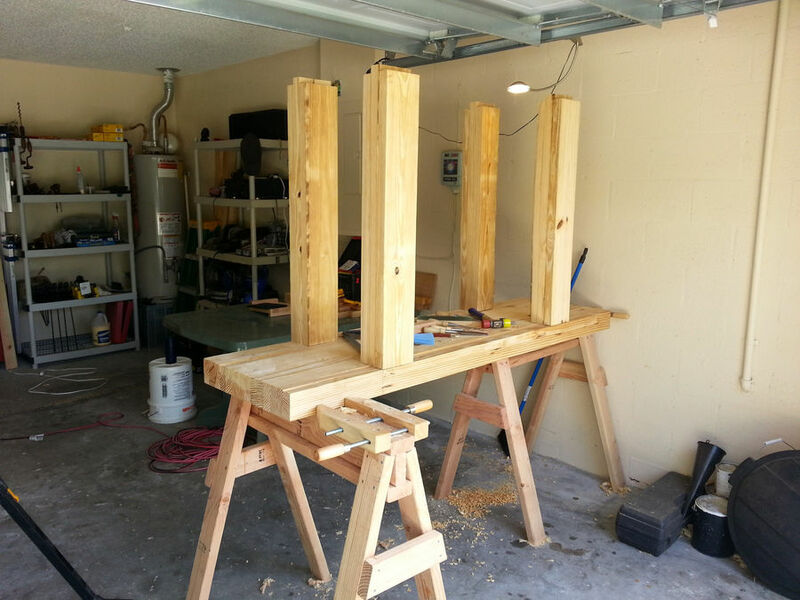 For the legs I used four 10 foot 2" x 6". 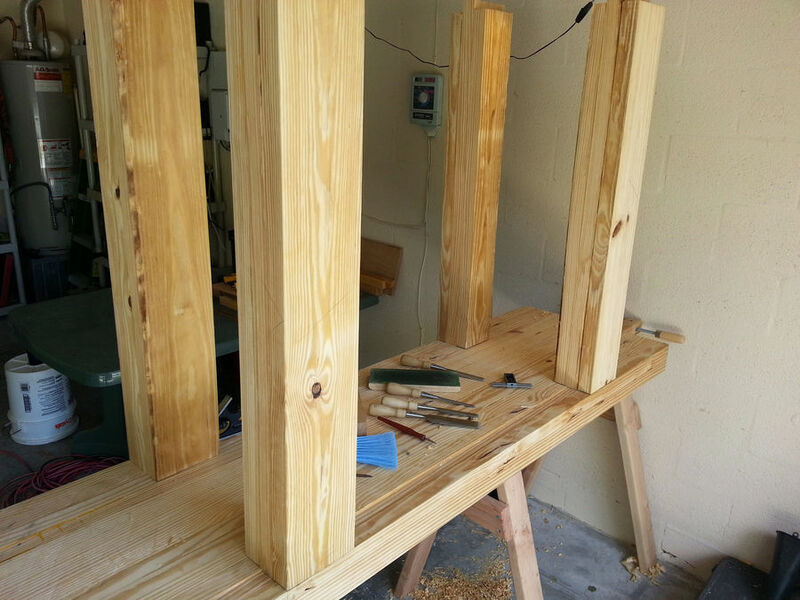 I cross cut them into thirds, planed them flat and glued them together. The short and long stretchers around the bottom are 2" x 8". 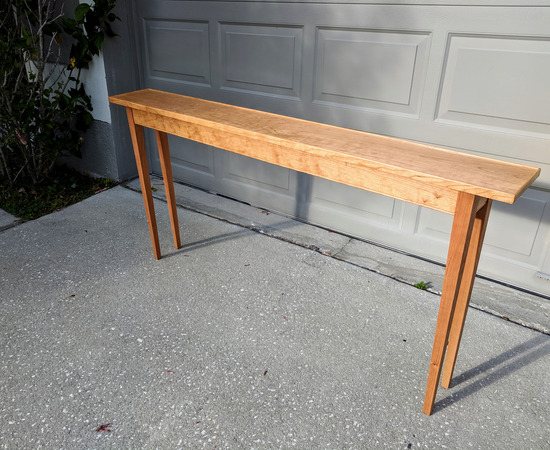 The finished size of this bench is 72" long, 21" wide, and 35" tall. The benchtop is 3 1/4" thick. So here she is in all her glory. 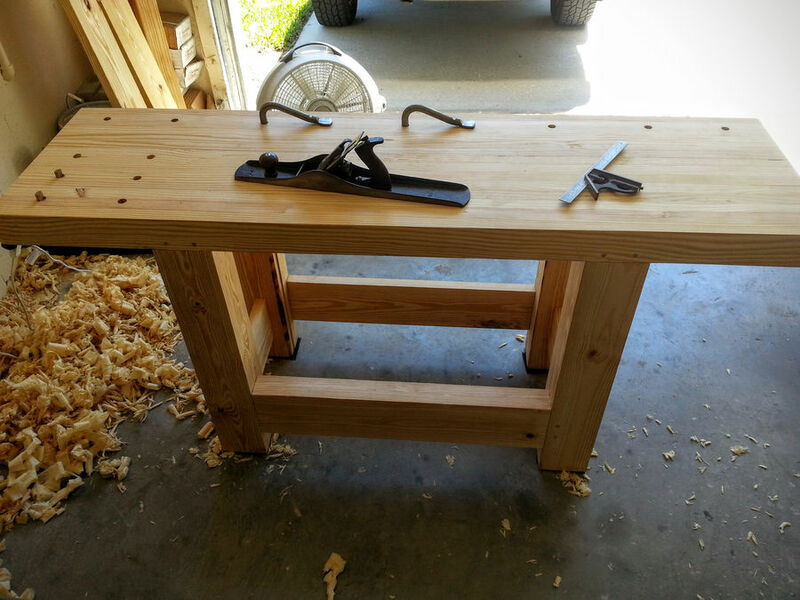 It was such a great feeling to get the bench finished up to full working order. 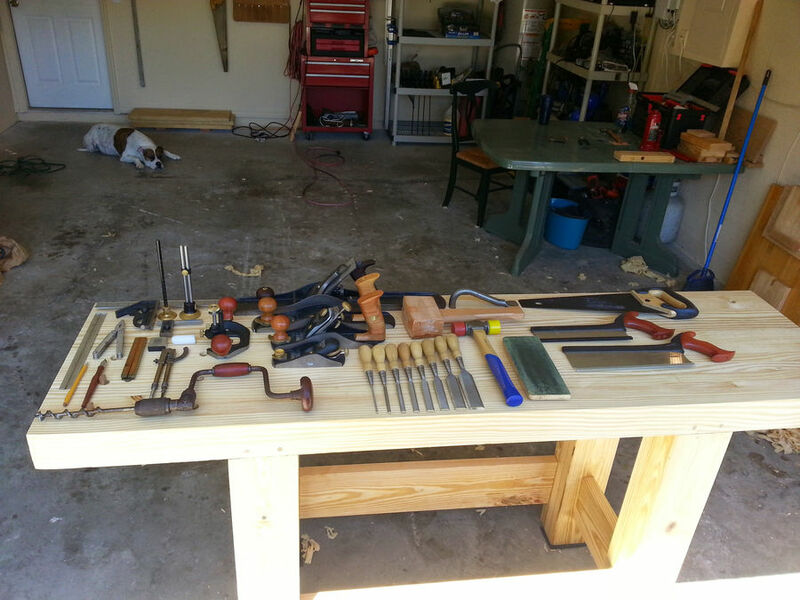 These are all the hand tools that were used in the making of this bench. 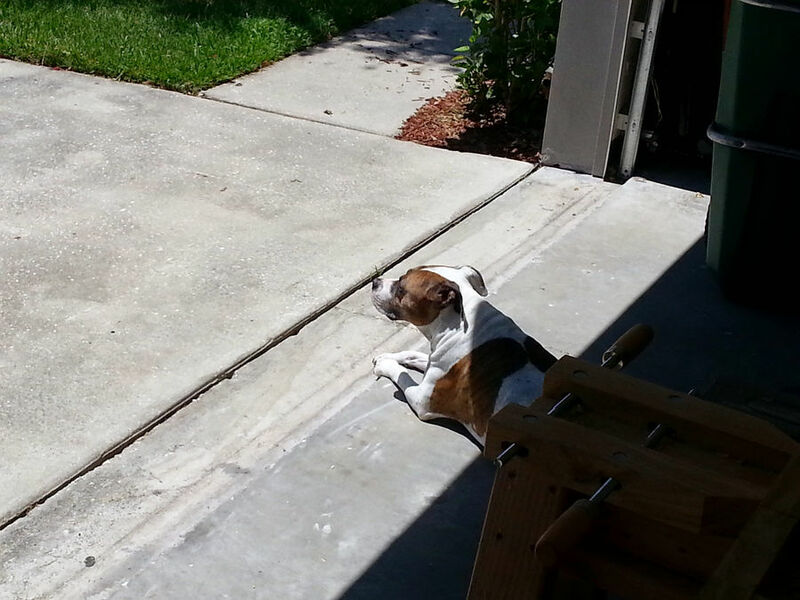 Oh, and that's Roxy, the shop dog, in the background. 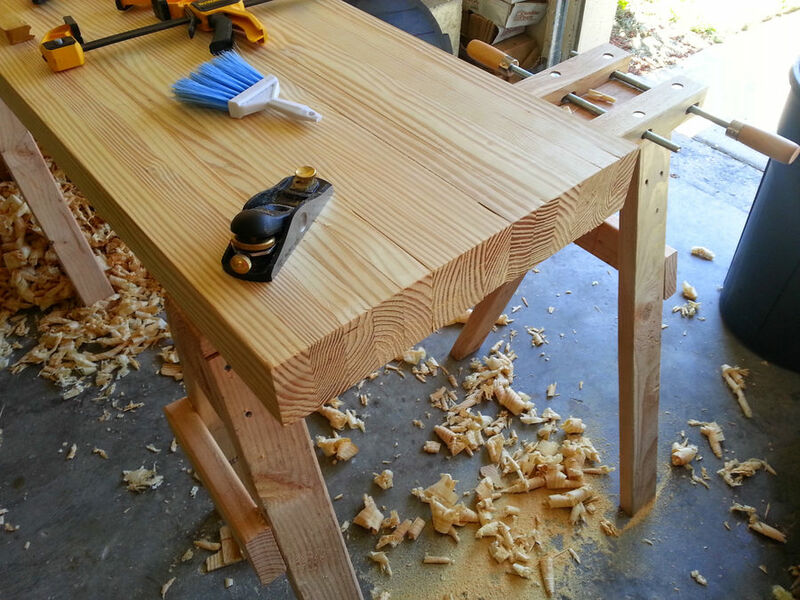 I had just finished flattening the top with this Stanley #7 Jointer. It's a type 9 from 1902 to 1907. I added a new Hock blade and chip breaker. 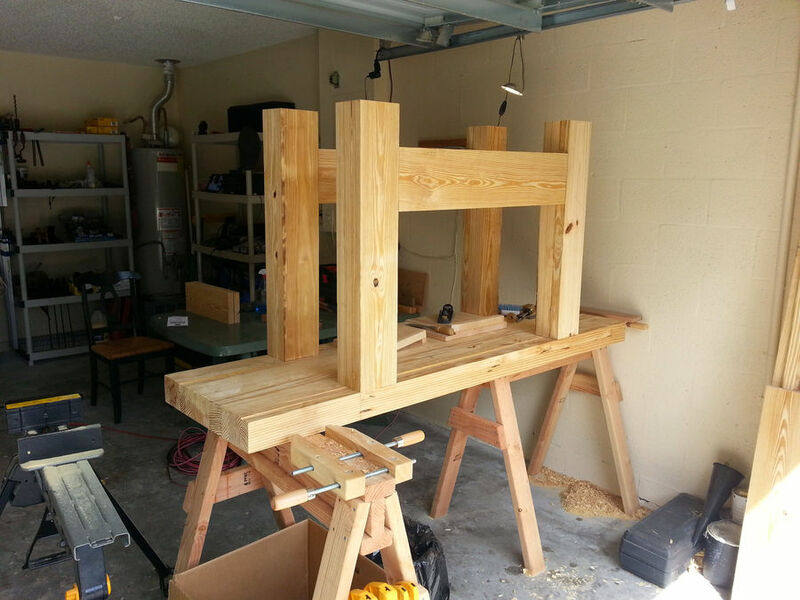 So here is how I got started, building a bench without a bench to work on can be tricky. 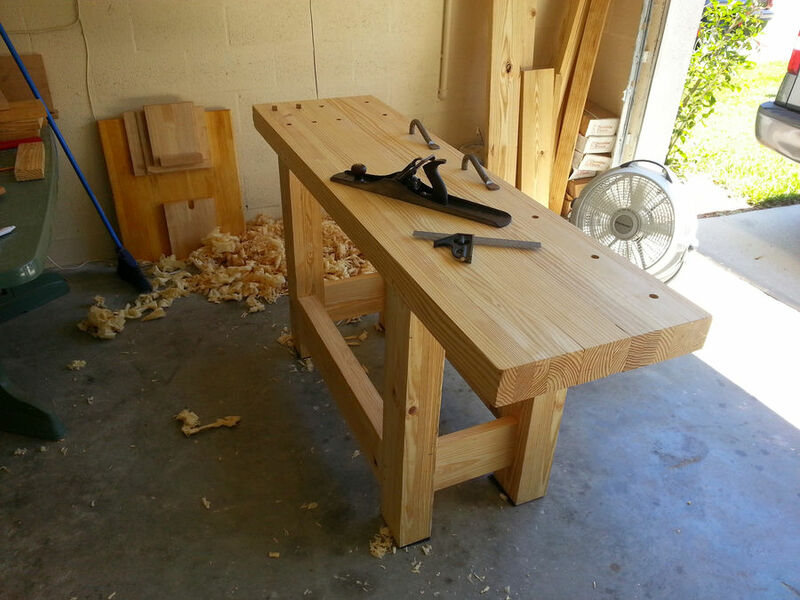 If you look in the background you can see that I have two saw horses (hand tools only too). I set them end to end to fully support the length of the board I was planing. 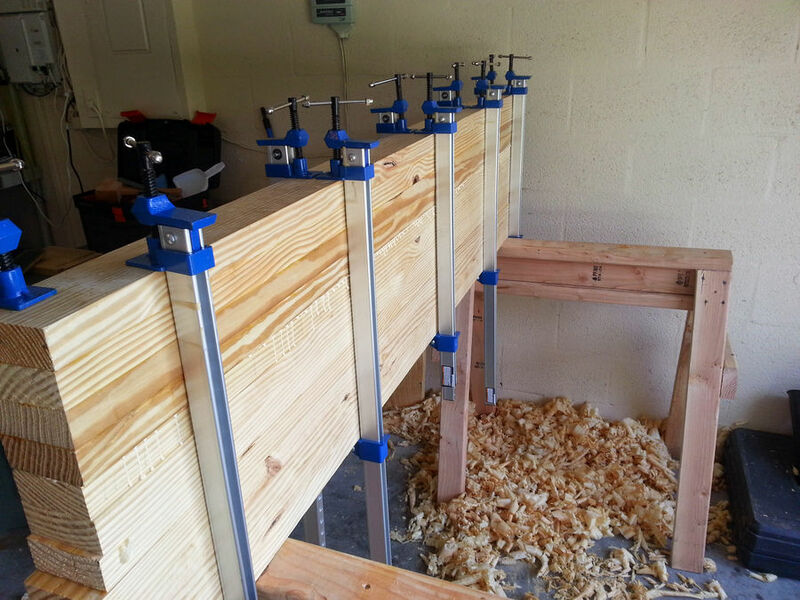 When I finished planing four boards I would glue them up and put them in clamps. Then I would get to work on the next four. HOLY COW! what have I decided to do? This the most cardio I've done in years! 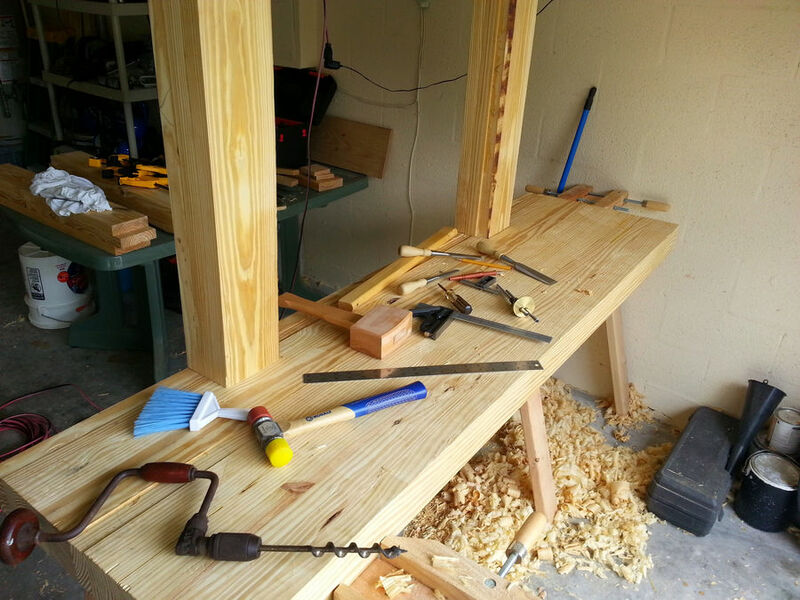 Hand tool work is tougher than I thought. 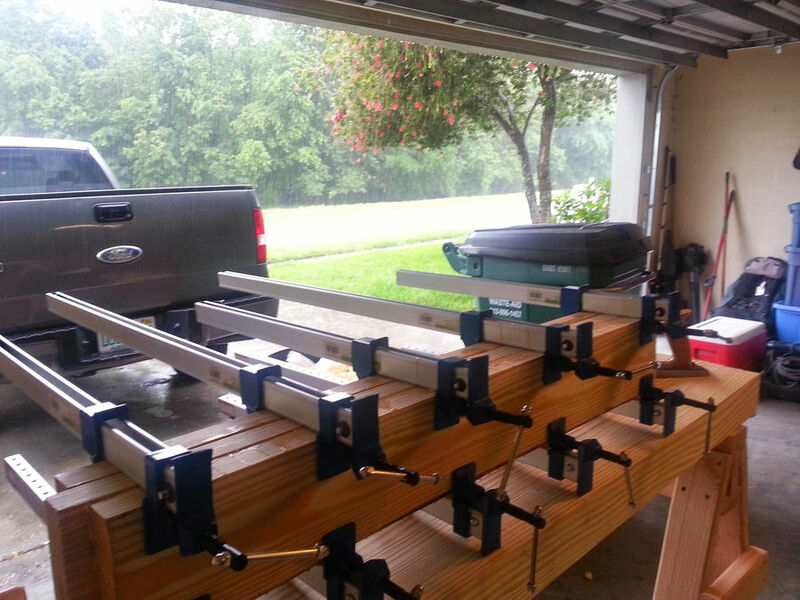 At this point I had eight boards laminated and I was sick and tired (mostly tired) of planing long boards. 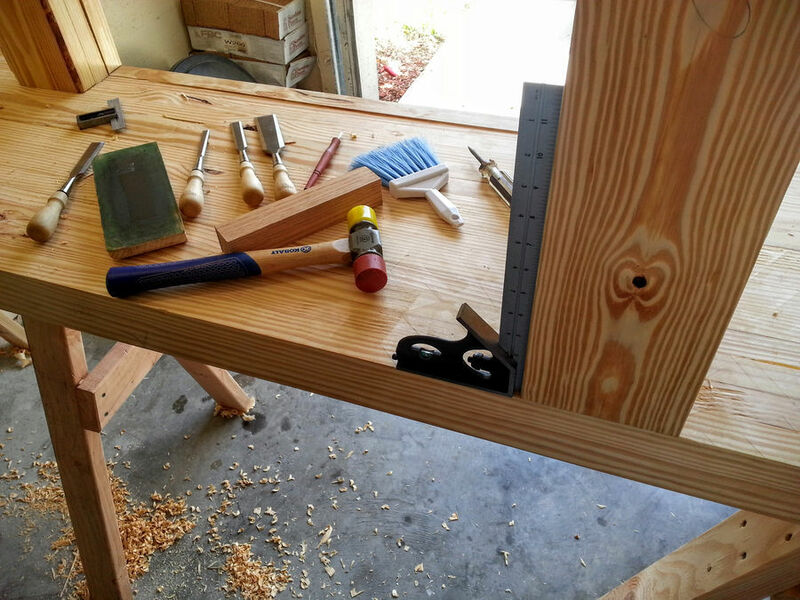 I used the the eight board lamination as a bench top of sorts and started working on some of the leg stock because they were smaller. 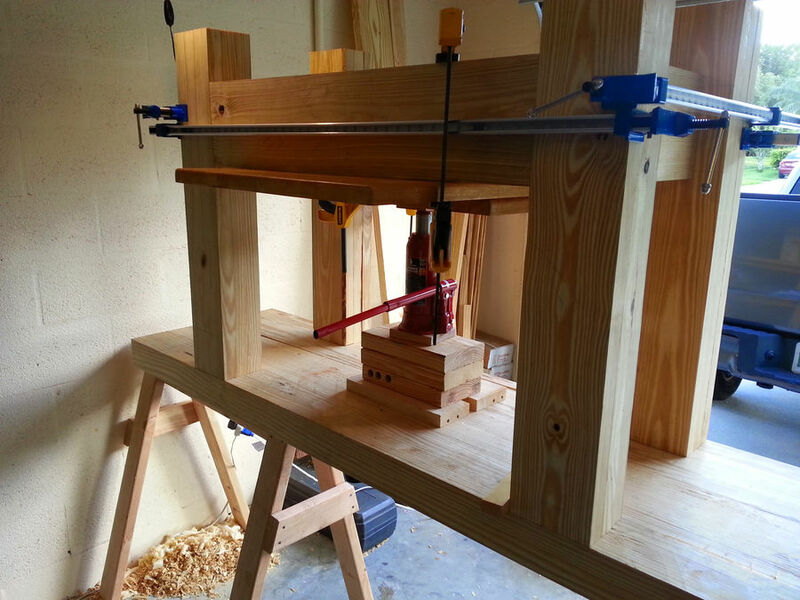 I clamped down stops and battons to hold my work without a vise. 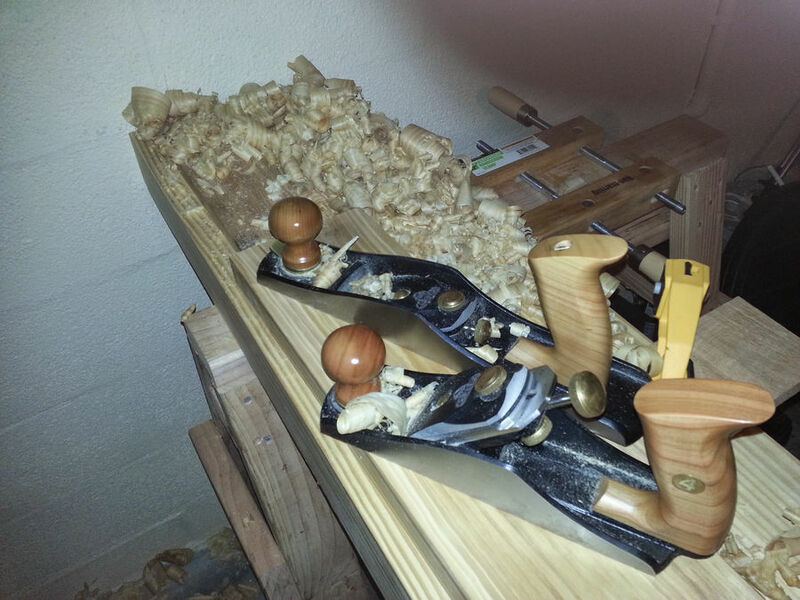 These are the two planes I used for flattening and smoothing of the parts. They are the new generation Stanley #4 and #62. I know now that they leave a lot to be desired, but they will get the job done if you have a sharp iron. 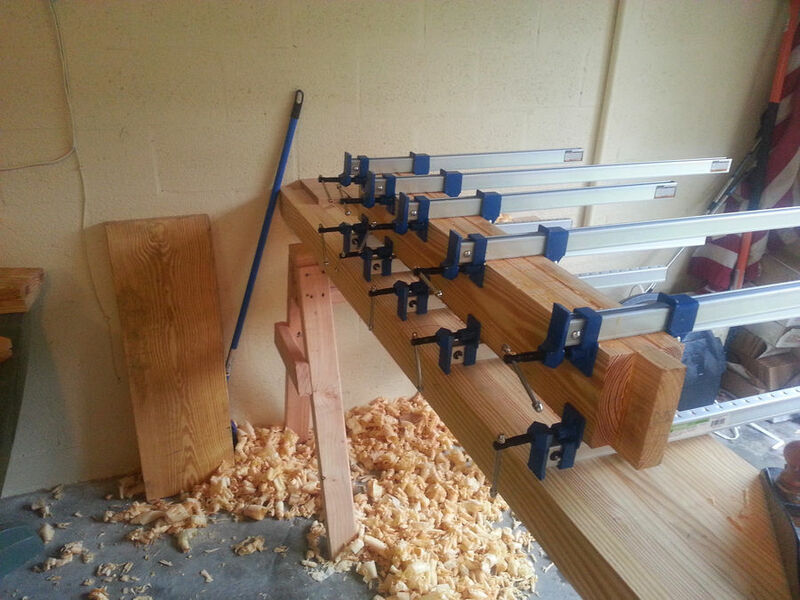 I would glue up four boards at a time and then add them to the others. There is nothing like seeing that sweet even glue squeeze out. When I cut the legs down I kept one of the three longer than the others. This piece went in the middle of the lamination and became the tennon. Waiting for glue to dry on a rainy day. 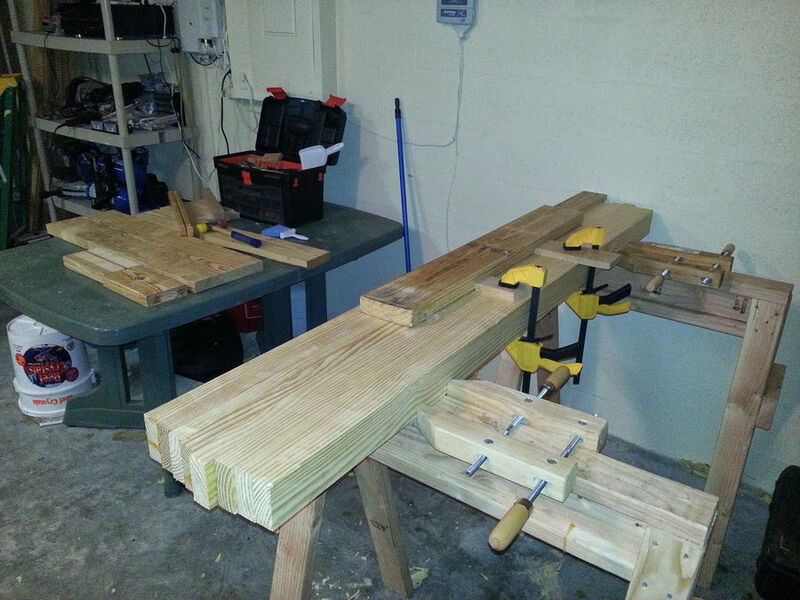 Now that the top is all glued up it's time to trim the edges. 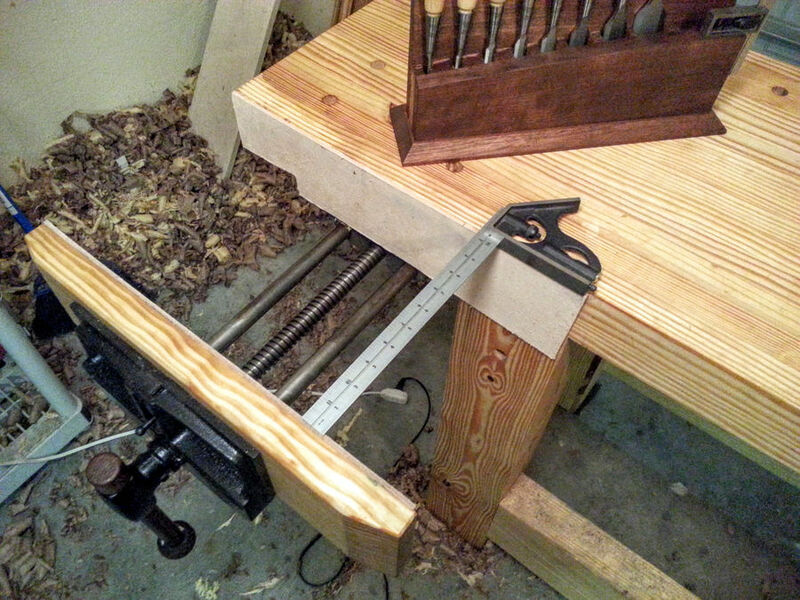 The first thing I do is clamp a batton in place as a straight edge. 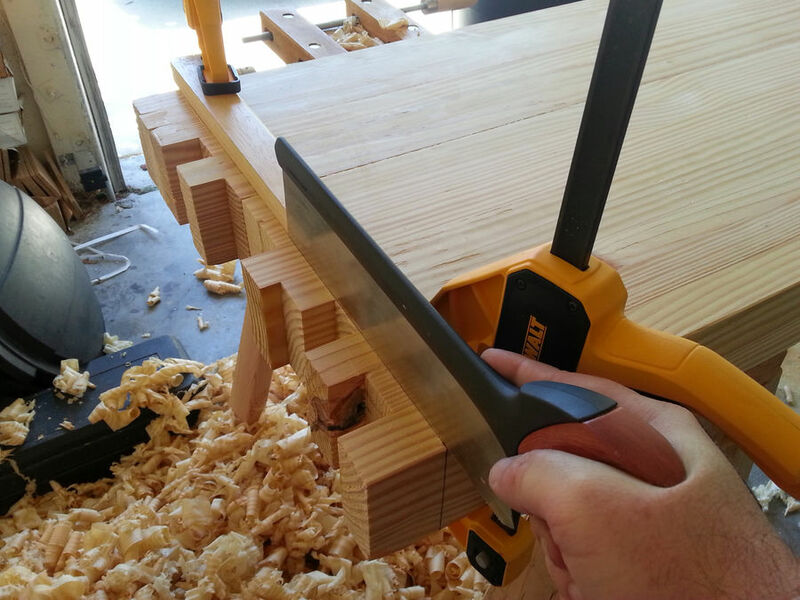 I use a cross-cut backsaw to start the kerf. 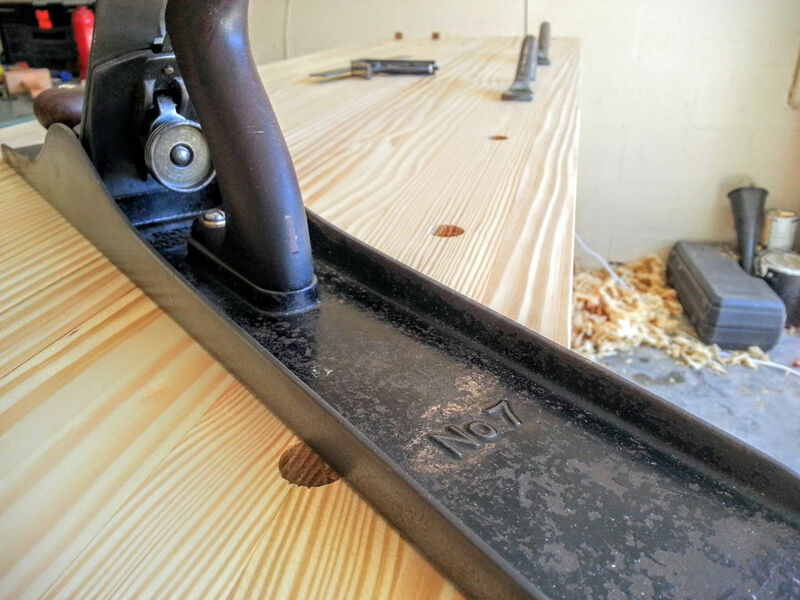 It doesn't need to be too deep, but it does need to be straight and it will help keep the through cut in line. 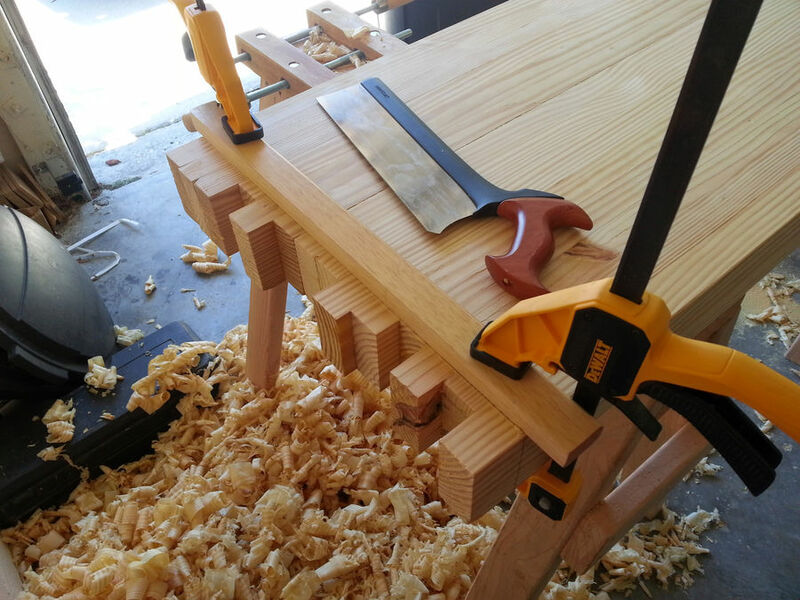 I switch to a heavier saw to finish the cut. It's not a vintage Disston, and it's not very long, but it cuts great and gets the job done. 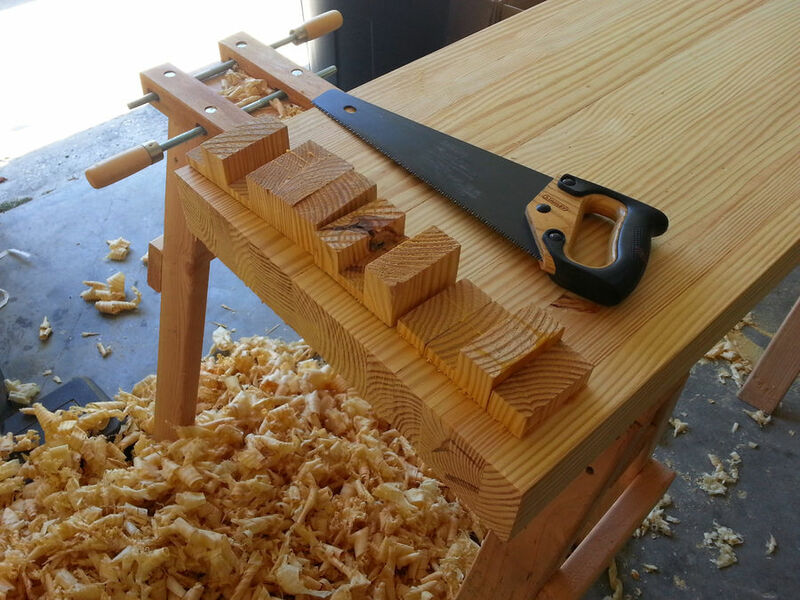 Finally I use a low angle block plane to smooth the end grain. 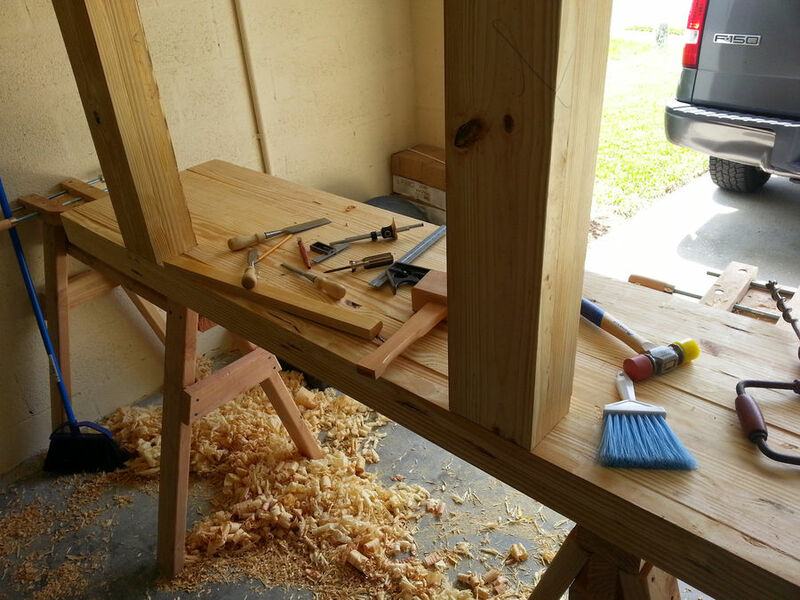 It's time to move on to the joinery. 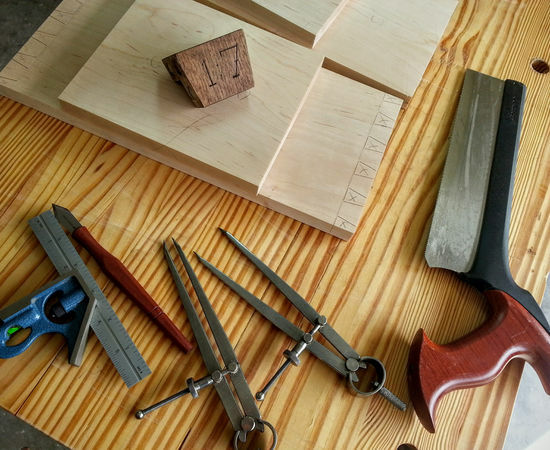 I mark out the mortice locations with a square and a marking knife. Then I use a brace and 3/4" bit to remove most of the waste. I used a scrap piece to count the number of turns that it would take to get the holes to the depth that I wanted. Then it was a just a matter of keeping the brace straight and counting the turns. 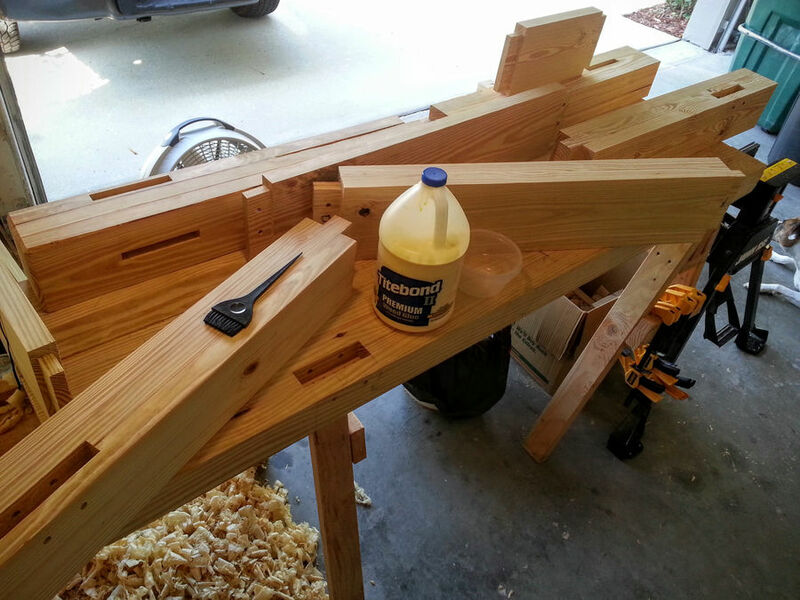 Once the mortices were finished and squared up with a chisel I cut the tennons to fit each one. 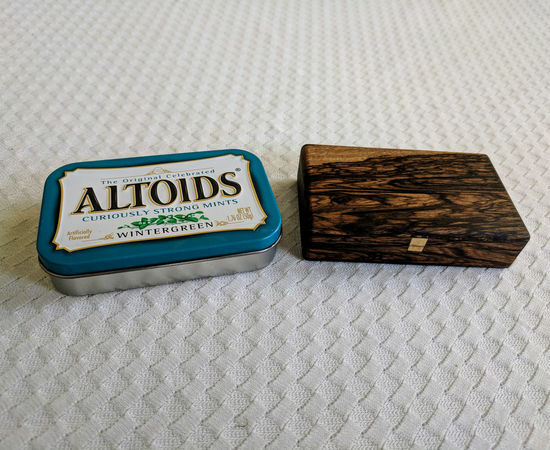 For a new woodworker (and maybe old ones too) there is nothing better than getting everything square. All four legs are fit and square. They're not cut to length at this point, but there are no gaps at the shoulders. This is Roxy, she's my shop dog. She loves the smell of shavings in the morning. 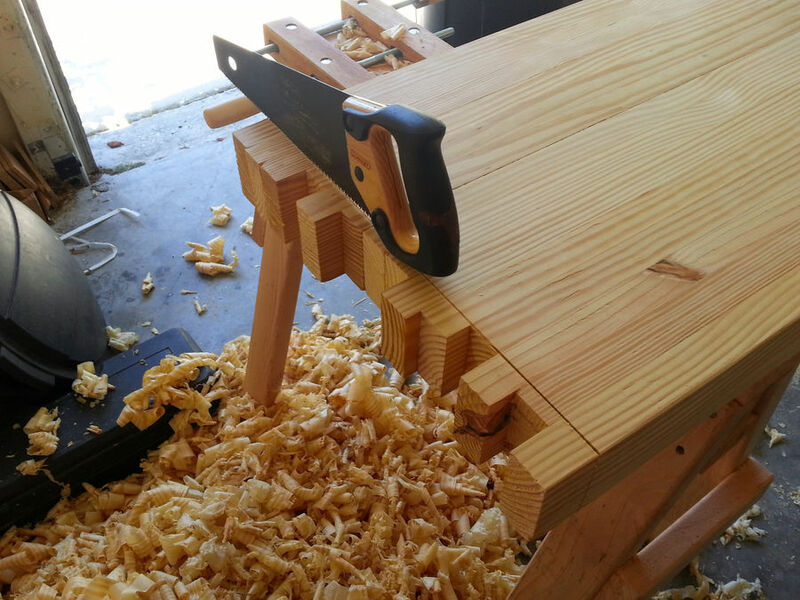 I had just seen a Paul Sellers video on cutting mortices by hand with just a bench chisel. Well, I decided I'd give it a try. 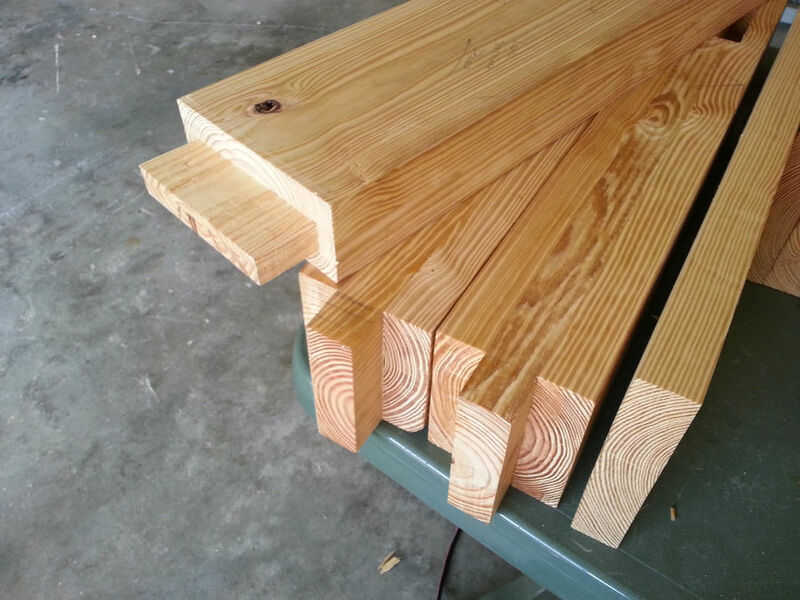 This mortice for the long stretcher is 1 1/4" wide, 5" long, and 2" deep. Sometimes I do something that makes me realise that I'm an idiot. 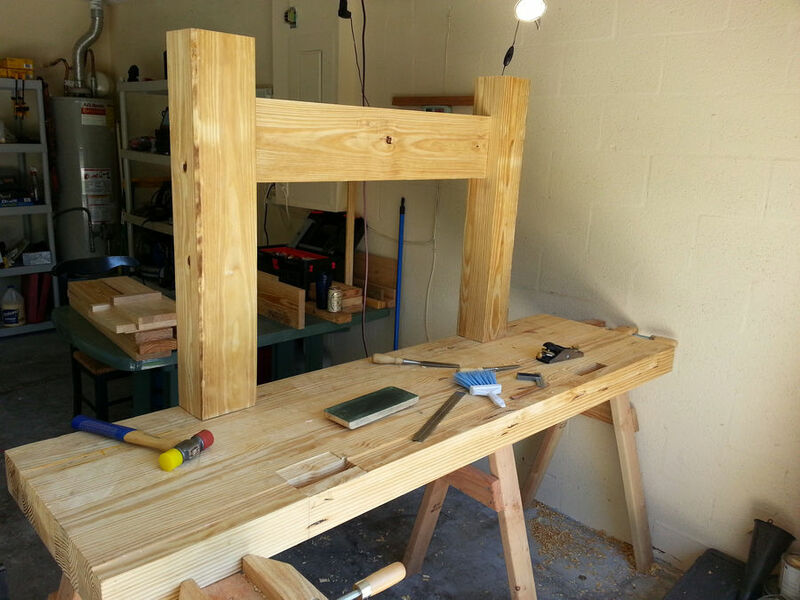 It worked fine, but it was not easy for a mortice this size. 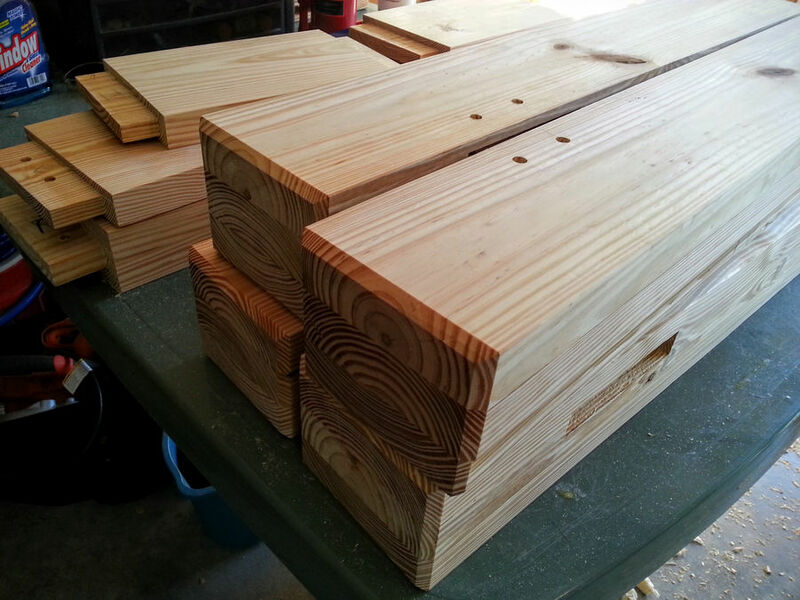 The rest of the mortices were done with a brace and bit first and then cleaned up with a chisel. 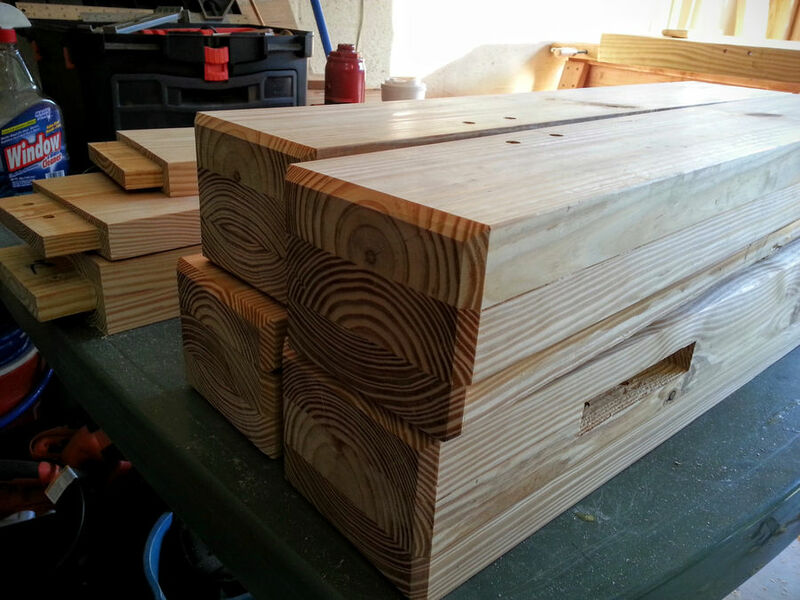 Stretchers are fit and the legs are trimmed to final size. 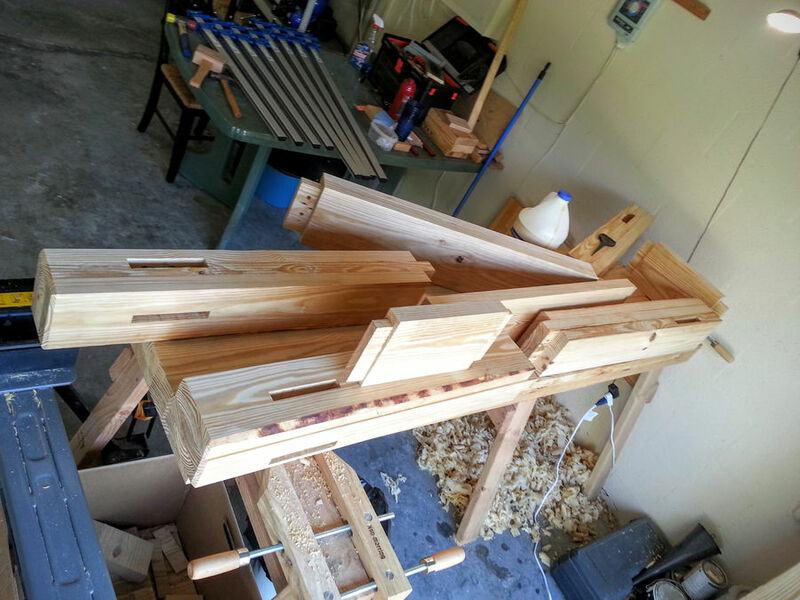 So now that the joinery is pretty much done, I did a dry fit. Everything fit great, but I could not get the pieces apart again do to the weight. 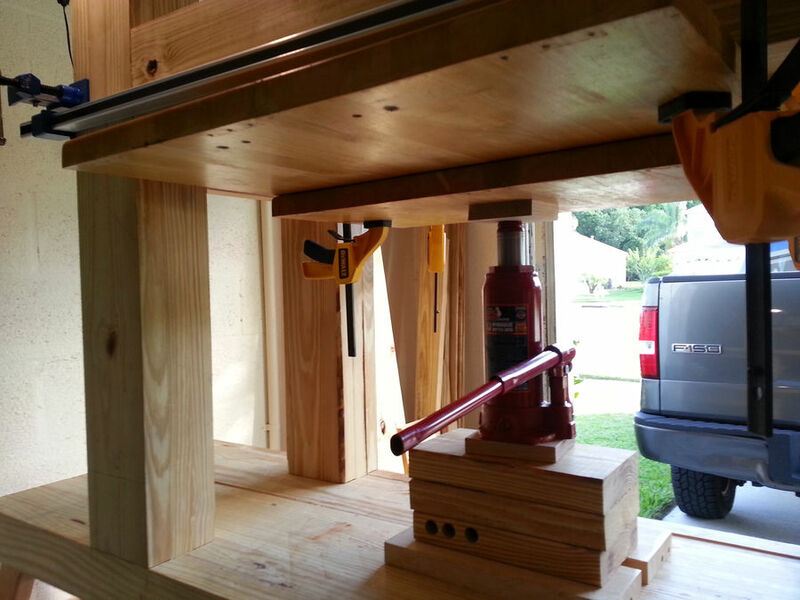 I had to use a 2 ton bottle jack to lift the lower assembly out of the mortices. 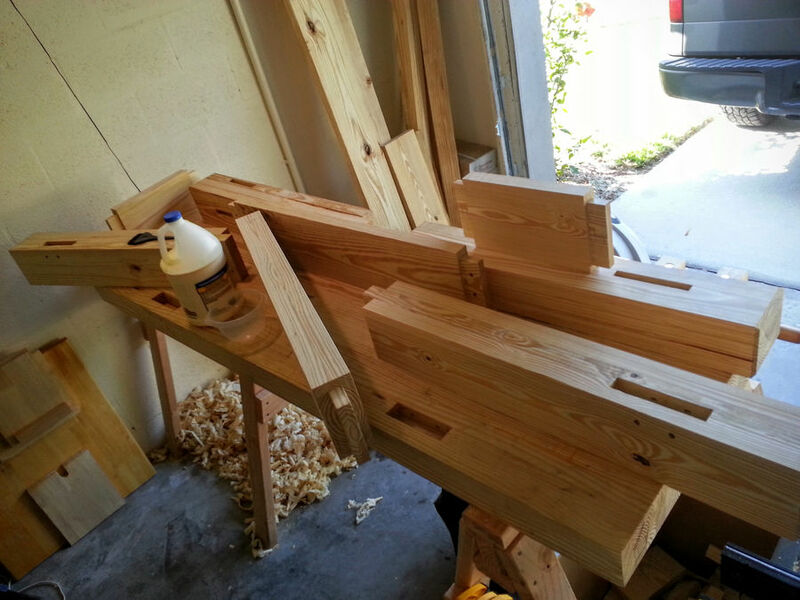 Now that everyhting fits, it's time to smooth the parts and drill for the draw bores. 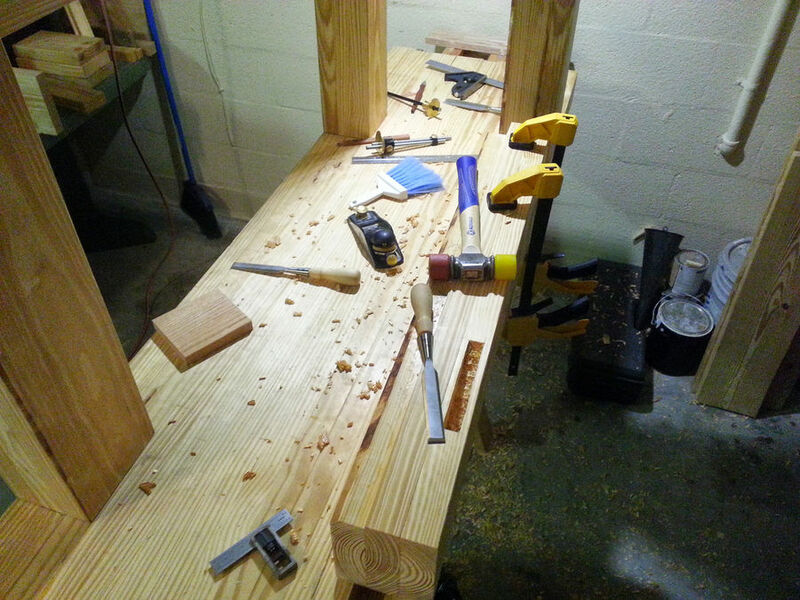 I also chamfered the feet to keep them from chipping out when moving the bench around. 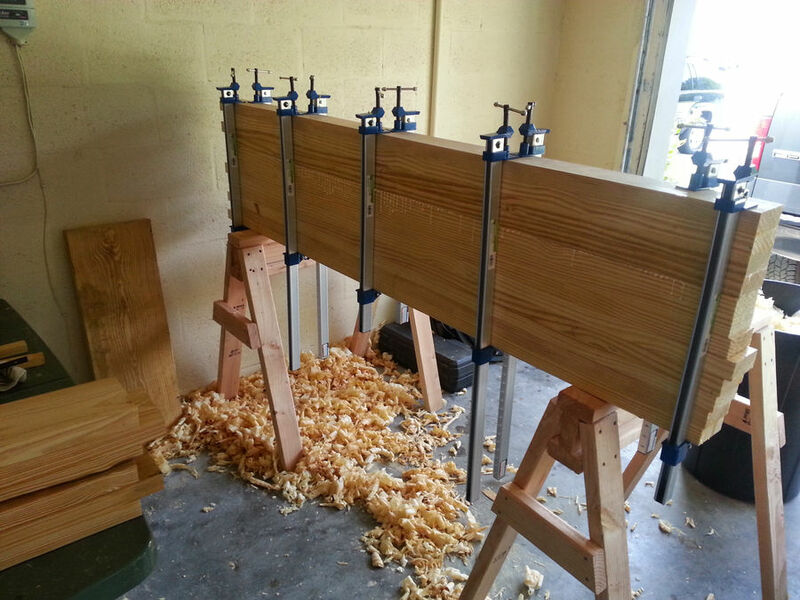 Here we go, time for glue up. I made sure to do a dry run with it so I knew I had everyhting at hand and ready to go. 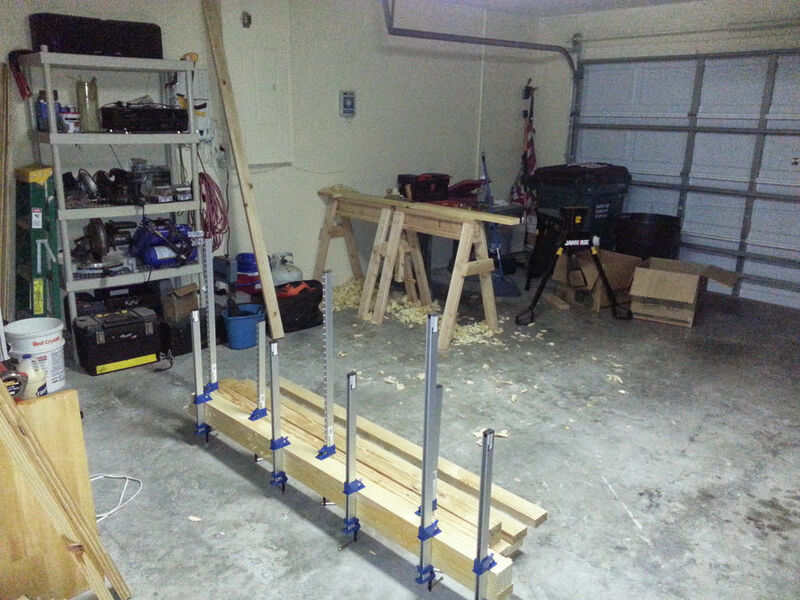 I layed everything out in a specific order and got my clamps and mallet put in place. 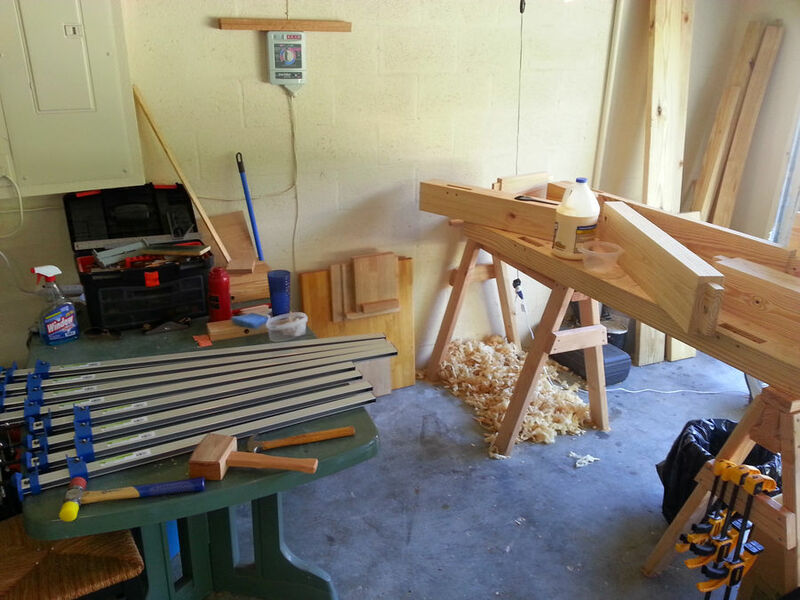 I know, I know, tight bond three has a longer open time than tight bond two, but it's what I have and I've got a good plan for the glue up. 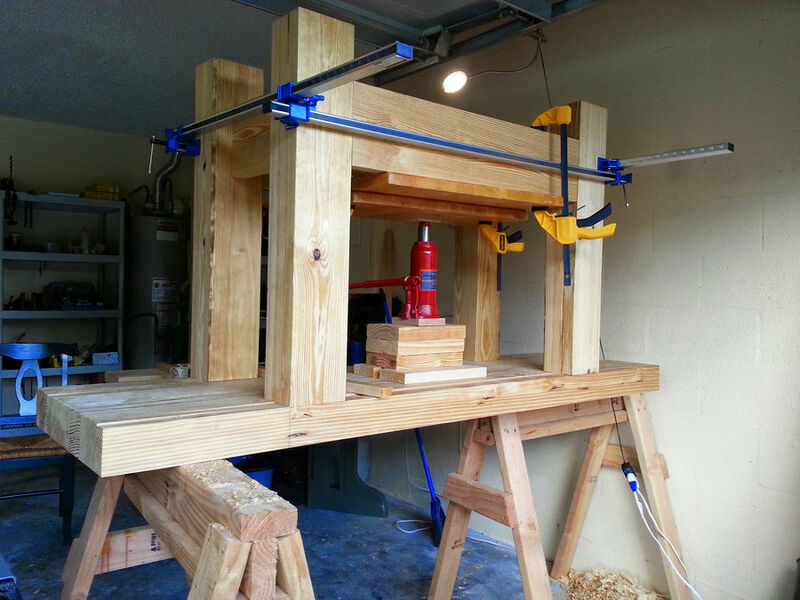 I got the glue up done as planned, by myself. I mentioned earlier that longer and wider 2x material has fewer knots to deal with. If you notice, there is only one visable knot in this entire bench top. Here I have just finished flattening and boring the dog holes. Stanley #7 type 9 from 1902 to 1907 with a new Hock blade. This whole build was completed with nothing more than what is on the bench here. 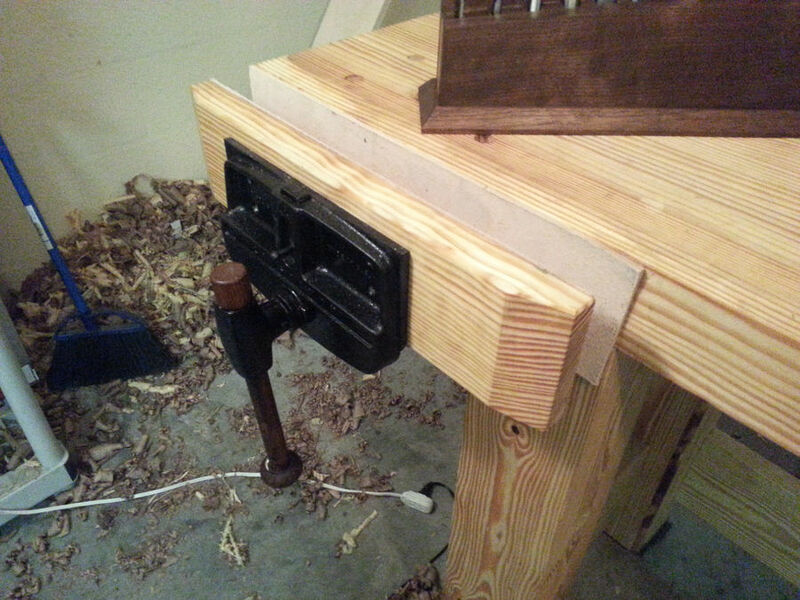 I found a 10" Wilton cabinet makers vise for $50 on Craigslist. A little wire wheel, a can of spraypaint, and some oil gets it good as new. Two turns to tighten and two turns for the quick release. 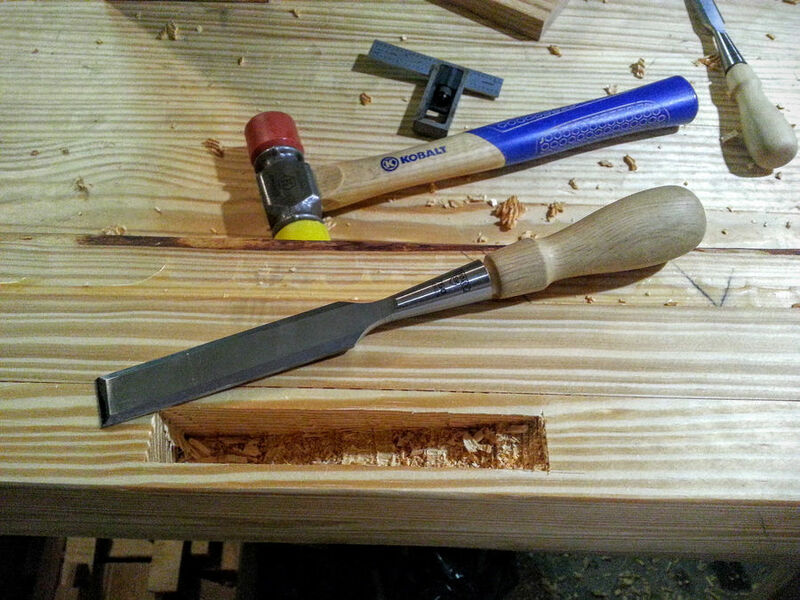 I added a19" chop and applied 9oz leather to vise faces and I get just over 10" of travel. 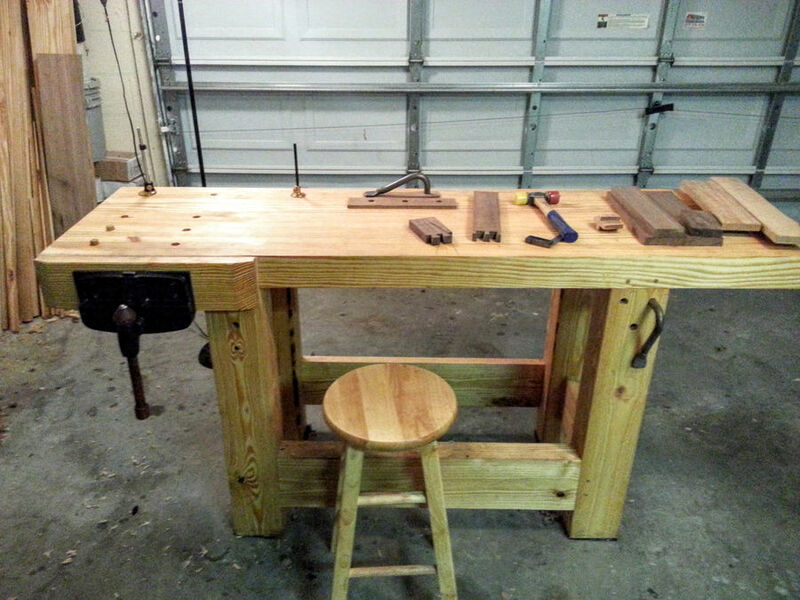 It took me just over a month to get this bench finished and it's the cornerstone of my little hand tool only shop. 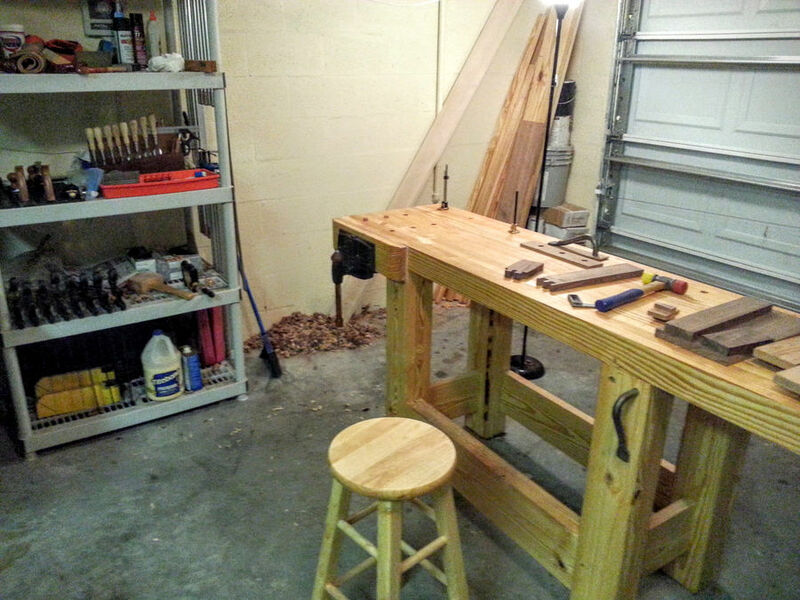 Just a note: I put that corrigated rubber shelf liner under each foot, it levelled out the tiny bit of rock that I had, and keeps the bench solidly planted on the concrete garage floor. It weighs about 250 lbs, I can move it when I need to, but it's solid as a rock when I'm working. 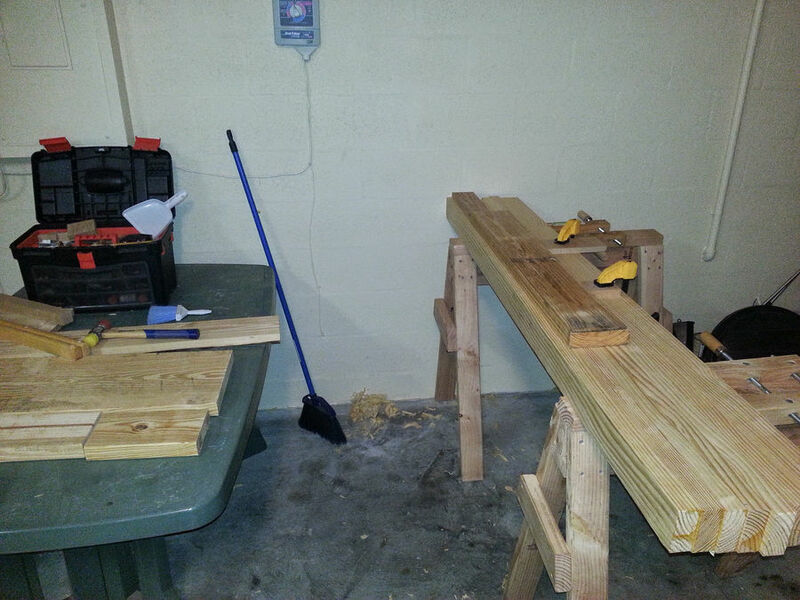 This is the very first hardwood project I did once the bench was done. 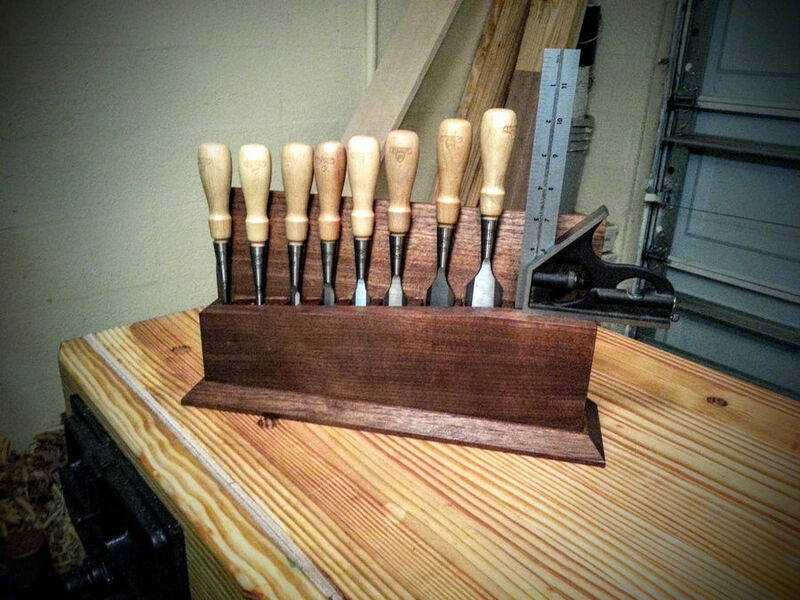 I made a sweet walnut rack for my Sweetheart chisels. 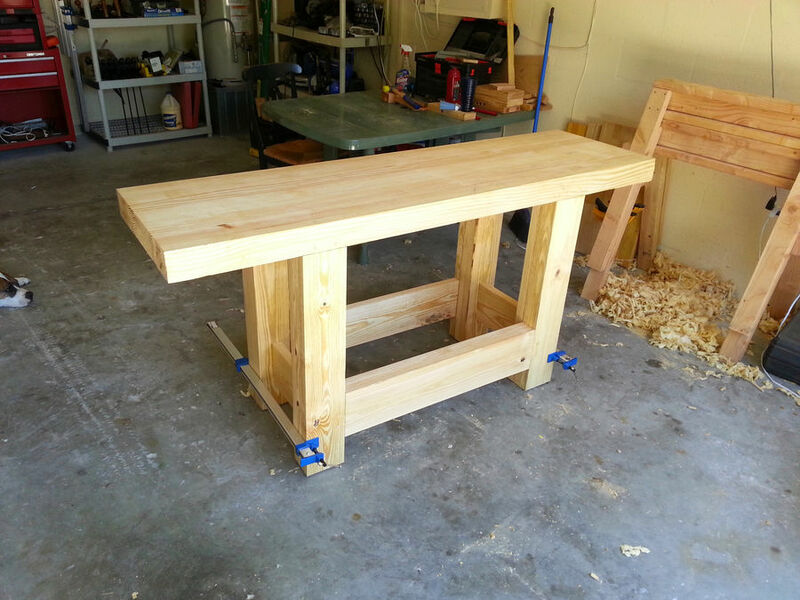 That is a beefy, solid workbench! Thanks Sean, I was so happy when it all came together as planned. 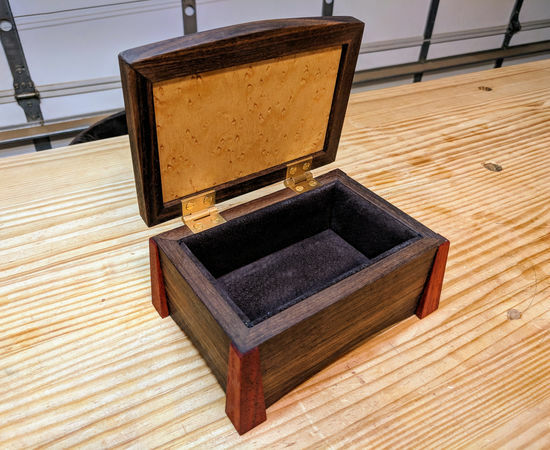 This was my very first woodworking project. There is nothing like trial by fire. 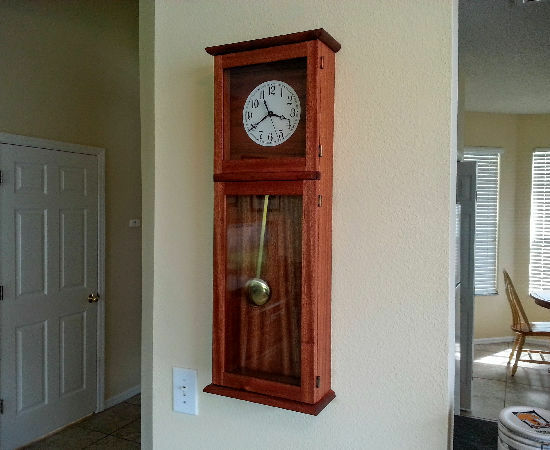 I have to tell ya, looking at your sketchup files, I really want to make that shaker clock. Would be an awesome guild build! Sean, I'll be posting some pictures of that clock soon. 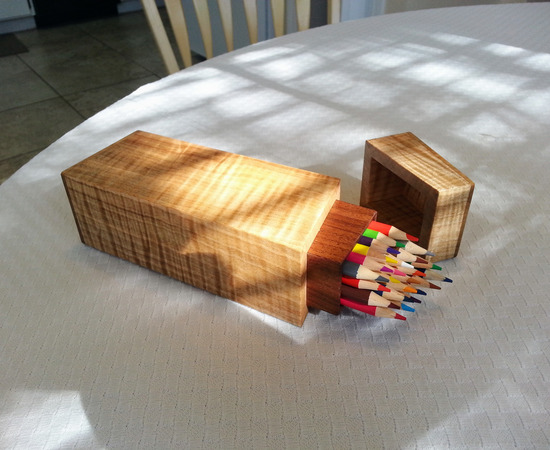 Great project summary and inspiring you achieved it with no prior woodworking experience. 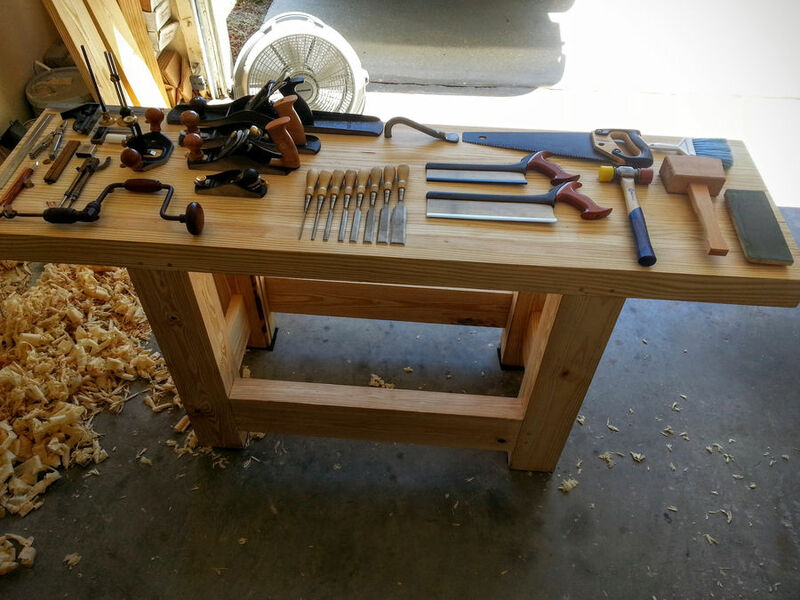 Looks like a great bench, thanks for sharing.